The differences between residential and commercial lawn maintenance is just like that between B2C (business to consumer) or B2B (business to business). The distinction is in their consumer motives, habits and behavior living at their core - driving their decision. 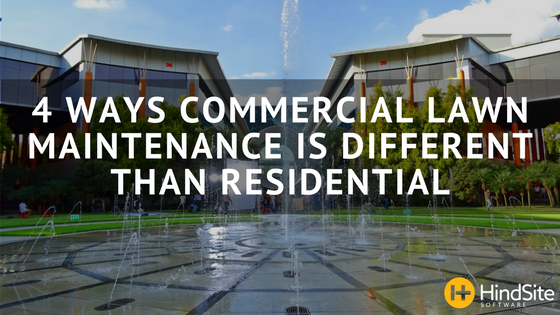 When it comes to commercial properties that means selling and building relationship with property managers. And they differ from your typical friendly retired couple (or any other type of residential customer). They have different goals, challenges and functions than residential customers. Financially, property managers have a strict budget. That’s not to say residential customers are completely find with spending more than they should. But pricing and bidding to a couple with a malleable “household budget” is nothing compared to a property manager with a financial iron-fist. Residential customers have a 9-5 job, they don’t have time to properly filter bids to find the best offer. But not the property manager, their job is to do exactly that, getting the best and most amount of service for the least amount of money possible. When it comes to the commercial market - and its players - it’s a new ball game. Here are some ways the two differ (in no particular order). The expectations that comes with commercial work is on another level. To start, the aesthetics of a property has financial consequences. It doesn’t get a measly bad look from a neighbor (like residential). Rather a dodgy looking cut can impact a business from overall appearance to bottom-line to the top-dog’s opinion of a property manager’s competency. They have specification that must be met to maintain customer traffic or maintain property’s rental attractiveness, tenants’ satisfaction and rates. Along with the work, they’ll also take into consideration what you have on paper (i.e. Licenses, insurance, certifications). Certifications show that you’re serious about what you do they understand that obtaining one is process. To commercial clients this reflects a dedication to your craft. Intense competition surrounds the commercial market - from binding to retaining. Winning new business is much more intense. During the bidding process, they’ll seek out as many offers they feel necessary - creating a fiercely competitive environment - to find their intended price. And once the business is won, there’s a much higher turnover rate than in residential. There’s always the chance that a competitor comes along and underbids you - pulling the (revenue) rug right out from under your business. As mentioned early, the very nature makes the commercial market extremely price driven and competitive. A firm understanding of your commercial pricing is a must. This allows you to effectively explain your services. And in doing so improves your negotiating position - pinpointing what separates you from the competition. Commercial work typically comes in the form of contracts, where the monthly price is based on certain terms. This results in a steady cash flow that easier to forecast and budget. And most clients are willing to sign multi-year contract. If it’s a property management company or a business (retail, restaurant) with multiple locations you’ll likely have the opportunity to serve these other properties at some point or at the very least have a leg up on the competition during the bidding process. For those lawn maintenance business owners with hopes of shifting their clientele from residential to commercial, know that this is merely the tip of the iceberg. From marketing to how you schedule, as you gain more experience you’ll likely expose other differences. For those who are just starting your business and trying figure out which customer you should focus on, here's are a few pros and cons of the two to help your decision. Commercial vs. Residential is a topic that’s frequents online message boards. If you have a relevant story, example or insight use the comment section below - we’d be more than happy to hear from you.